I still remember when I first heard about Joni Sternbach. I was having lunch with a friend, and discussing our own trials and tribulations with making a career in the photo industry. During these times we would often throw out people or work that moved us, confused us, or inspired us. 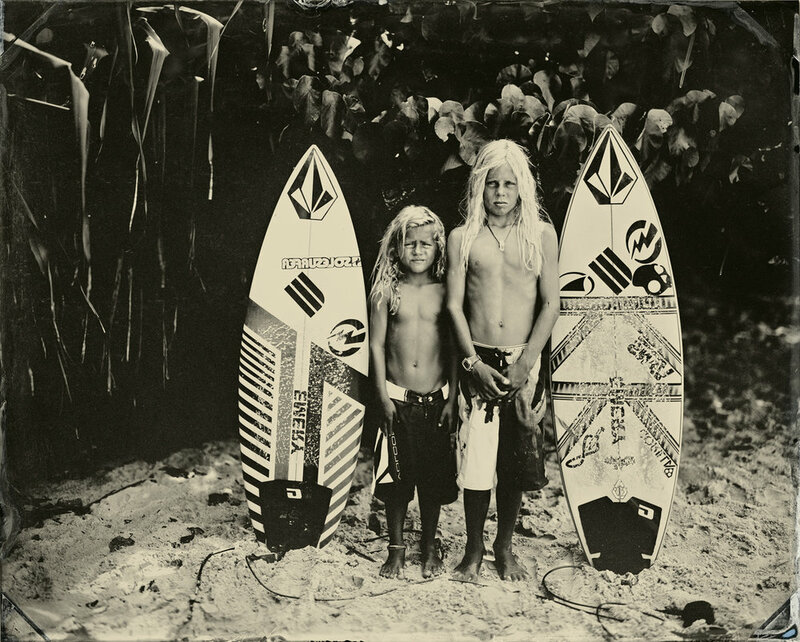 It was mentioned that this photographer was using the wet plate collodion process to photograph surfers, and that a book of this work was recently published by the Photolucida organization as part of their Critical Mass book prize. I was subsequently showed this book soon after, and of course proceeded to order my own copy. It was not what I was expecting, and that was a very good thing. Yes, unexpected was definitely the word. I grew up in California with surf culture a part of the lives of so many. I read Surfer magazine often, even though my own attempts at surfing were more like attempts at suicide. I simply appreciated the culture, the camaraderie, and the zen quality of life in the waves. I may have been terrible at it, but the feeling out there is quite wonderful. Needless to say, Joni’s work brought back great memories for me. I was not at all connected to that world anymore, but her portraits of people that live a full and extraordinary life are in full focus. If you heap onto this the fact that these stunning images were created with such a difficult, problematic, and all consuming process just added to the impact of each plate. Her book also seemed to set off a trend of using collodion en masse, even though there were many before her who had been practicing this process for decades. I wanted to know more about Joni and what drove her to choose this process and this subject that marries what at first thought might be an odd combination…because that first thought would be dead wrong. Her work is included in many public collections, with recent acquisitions from the Harn Museum, MOCA, Jacksonville and National Portrait Gallery in London. She is the recipient of several grants and prizes including the Clarence John Laughlin award, NYFA and 2nd prize winner in the Taylor Wessing Portrait Prize competition 2016. Michael Kirchoff: First of all, how about a little background on what got you started in photography in the first place? Joni Sternbach: Photography evolved out of my high school and early college fine art practice. It offered a break from the intense painting and drawing critiques in art school and it was fun as well. I guess I took it a little too seriously though, because I switched majors and graduated with a BFA in photography from SVA (School of Visual Arts) in New York City. MK: Was there a particular person who inspired you to begin working with collodion? JS: Not at first. I took John Coffer’s workshop not looking for inspiration or even another medium to master. I thought I was just spending a pleasant weekend in upstate New York to learn something new. Once I realized just how much the art and technique of wet plate fit into what I like to do best, such as make things, I was both intrigued and inspired. And because John lives a 19th century lifestyle, I knew that I wanted to make a body of work that incorporated contemporary elements with an old technique. Sally Mann made her first large scale, tea-toned collodion based landscape prints a few years after this and I found that incredibly inspiring. MK: Making tintypes comes with a huge learning curve in order to master it. This is an all or nothing proposition, and a serious commitment. Was there ever a time that you had second thoughts about using this process? JS: Ha, funny you should ask. Every time something goes wrong on the beach I think it’s my last shoot. I have a friend I’ve told, “that’s it, I’m quitting wet plate” to many a time. The medium inspires second thoughts. It’s a good thing I didn’t realize there was this huge learning curve when I started. MK: Truly, this body of work is much more than a simple document of surfing, and certainly this type of process lends itself to some intriguing portraiture, but how did the idea of merging this with surfers and surf culture come about? JS: Photographing surfers evolved out several landscape projects I was working on at the time. It had something to do with persistence and happenstance with a little bit of serendipity thrown in. Maybe it was an accident, or fate, but it certainly wasn’t a well-conceived idea that I pursued until after I made the first surfer tintype. After learning wet plate and pursuing a project (Abandoned) with it I was looking for something new. I went back to an old location that I’d shot at for many years with film. There I ran into a guy who was a surfer, and I made the tin, Lone Surfer. That’s when the project began. MK: Was there a particular milestone or turning point in your career that set you off on a higher level than ever before? JS: I’d say that the publication of each of my two books changed things for me career wise. There is a validation of a body of work that a book brings to ones career. I also think that this project gained meaning and momentum during it’s decade long life and that has contributed. MK: I’ve had the pleasure of viewing many of your original plates at both Rick Wester Fine Art in New York City, as well as Von Lintel Gallery in Los Angeles, and truly there is nothing like an original. Do you ever find it difficult to part with such one of a kind work, where so much time and effort goes into creating each of them? JS: That’s a good question. When I first make a plate there’s a lot of attachment to it, especially if it’s one of my best. But it’s very validating having people want to buy the work. It’s encouraging and inspires the belief that the project reaches people and has merit. MK: You do much more than make tintypes, but do you ever feel pigeonholed as only a tintype photographer? If so, does it bother you or make you feel you need to break out of a stereotype? I ask only because I’ve met a few people over the years who have actually grown resentful of the work that has brought them a certain level of notoriety. JS: I guess I will have to have more notoriety as a tintypist in order to feel resentful for it. All kidding aside, I think the answer is yes, that I am thought of as the woman who photographs surfers in tintype. Working on this project for over ten years doesn’t add to the belief that I can do much else either. On the other hand I recently did some work with a magazine and they wanted me to work in color. They didn’t care what format I shot with, just what I was shooting. MK: Your book Surf Site Tin Type is an incredible body of work created with the wet-plate collodion medium. What was the process of putting this book together like for you? JS: Making books is a lot of work. I had no idea just how much. Especially in this day and age when you have to be your own advocate on so many levels. I did a Kickstarter project in order to publicize and to sell the book. Every aspect of it was difficult. One of the hardest parts was getting the files together so the tintypes had more luminance on a printed page. MK: Normally I would ask how you go about finding people to photograph, but I can only imagine the amount of people that come looking for you in order to become a part of the magic. In spite of this, are there certain people that you seek out? JS: The people that I seek out are the people who contribute to the sport historically. There are the folks who use their surfing prowess as action for change, mostly environmental, like Dave Rastovich. There are also folks like Bruce Brown, the film maker who made Endless Summer. These are not people who are looking to have their tintype portrait made. MK: You’ve photographed so much around the East and West Coasts of the United States, as well as England and Australia. Anywhere else, and are there any plans to continue exploring other parts of the world where surfing is not as well known or prevalent? JS: I recently shot in Uruguay and a few years ago in France. It is so super exciting to make these portraits around the globe. They are united by this one common cause, SURFING, and divided by the same body of water that also unites them. It’s a crazy idea to me that I could shoot surfers in the Atlantic ocean and be in Europe or South America as well as Montauk, NY. Hawaii is my next stop. Maybe then I can retire from wet plate. MK: What type of preparations must be made in order to take your photography on the road? JS: Extreme planning and good will. Since the wet plate world has expanded significantly since I started this project, I can now go to places and shoot (Uruguay for example) that wasn’t possible before. The internet has expanded our ability to connect and it has certainly helped me in my endeavors. Creating a wet plate kit overseas requires many lists and some home grown skills. Many a time I just make a dark box out of cardboard and pack it in my suitcase, this way, I can tape it together when I arrive somewhere and start shooting pretty quickly after my arrival. MK: Any exceptionally interesting stories from one of your shoots? JS: I met a woman in Rhode Island who came out to have her portrait made. She brought with her two loaves of bread from a local baker as a gift for me. After we made a few pictures she wanted to tell me her story. It was a story of her diagnosis with cancer, her long illness and how surfing saved her life. MK: I know our readership would love to know a little about the gear you use in creating your tintype masterpieces. Is there a favorite camera or lens you gravitate to for your portraits. Any other things that help you out in the field making work? JS: I have been using my Deardorff 8x10 camera since the beginning of this project. I had it adapted to take a wet plate back, so I can pop off the film back and pop on my wet plate back pretty easily. I also use a Deardorff 11x14 camera modified to make 14x17 inch tintypes, and recently both 11x14 and 16x20 Chamonix. One of my favorite Petzval lenses is the Dallmeyer 3D and a Jamin Darlot, but often I use modern lenses too. My kit all fits into the back of a Golf VW wagon, so it’s pretty compact. The things that help me the most in the field are a trusted assistant and extra hands to help carry stuff. MK: With the proliferation of digital technology taking over the photography world, there seems to be some pushback from the analogue world. We are beginning to see a trend of more and more photographers taking on historical processes. Do you feel this is exactly that, a trend, or that possibly people have a desire to return to the way we used to create work before the pixel took over? JS: I think the advent of the digital world definitely created a push back. I also think that the internet has also helped spread the idea of ‘making things’ and that definitely seems to be a trend. There’s a style and flavor to the hand made object that the digital output just doesn’t have. MK: What’s up next for Joni Sternbach? Any plans for another book, a future exhibit in the works, or other exciting news you can tell us about? Your adoring fans need to know! JS: You are very sweet! I have an upcoming solo show at The Harn Museum in Florida this Fall. It’s a retrospective of sorts and will feature work made in multiple mediums, from cyanotype to platinum, tintype to large-scale inkjet prints and a couple of videos. I even made my first ‘surf’ film with my Yale intern, Clara Mokri. I have a couple of other book ideas in mind too, but none that have gotten off the ground. JS: OK, what you don’t know about me, and maybe you don’t want to know, is all the years of disappointment I accrued being an artist. I didn’t always make good work and even when I did, it wasn’t always well received. My biggest words of advice to anyone wanting to pursue photography as an art is to remember that you are doing it to please yourself. Taking pictures as a career means that you have to please others with your work. Hopefully you can combine the two. You can find more of Joni's work at her website here. This interview originally published in Issue 55 of Blur Magazine, June, 2017.